Book your 2018 spring turkey hunt now! Jackson Outfitters offers exciting Colorado Merriam Turkey Hunting opportunities, including youth Turkey Hunts! We are dedicated to providing enjoyable, quality turkey hunting, and we have very good success rates. These hunts are 1-1 or 1-2 guided hunts enabling us to provide personalized attention to our clients. Let us share the excitement of calling you in a big Tom! If you would like to arrange a turkey hunt you are welcome to give us a call. We look forward to speaking with you! Our Turkey hunts are provided on our public land permitted areas and private property. We have a very healthy population of Merriam turkeys. We have harvested large Tom’s every year, many up to 20 plus pounds with nine inch beards. 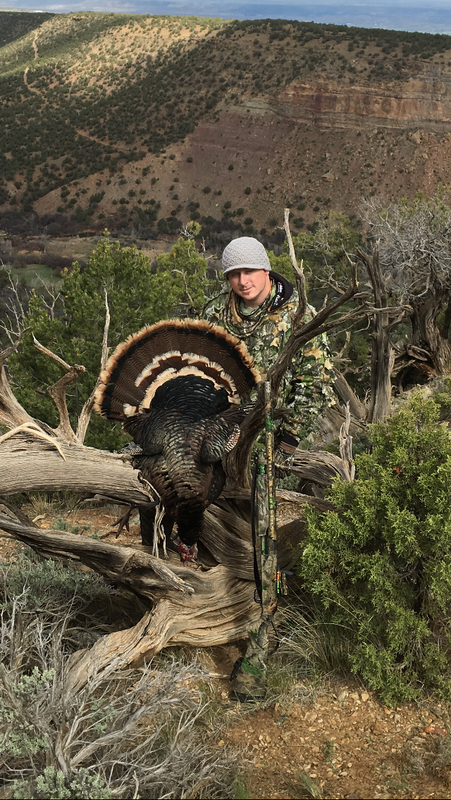 The majority of our Colorado Turkey Hunting is offered in the spring during the strut, however we do offer fall turkey hunts as well in combination with our big game hunts. *The great turkey hunter pictured here finished his 2016 Grand Slam with a Merriam’s Turkey through Jackson Outfitters! Call us for pricing on our Colorado Turkey Hunting services, or Book a Merriam’s Wild Turkey Hunt with Jackson Outfitters today!